← Democrats to Run a Great Moderate! It didn’t take long for freshman Congresswoman Ilha Omar-D, shown at left to show her true colors, which are not red, white and blue. She tweeted that members of Congress and by inference those in her own party, are being paid off with “Jewish money” to support Israel. When the House Speaker, Nancy Pelosi, found out what was said, she went ballistic. She said Omar’s use of anti-Semitic tropes and unsupportable accusations are deeply offensive! An angry Pelosi called on the first term Congresswoman to apologize immediately. The House Foreign Affairs chairman and House Judiciary chairman echoed Speaker Pelosi’s condemnation of Omar’s remarks, saying she (Omar) has failed the first test of leadership. They referred to her comments as, shocking, hurtful and intolerable. However shocking it was to democrats, it came as no surprise to most of us who know this is not the first time a Muslim politician has made harsh anti-Semitic remarks. What is shocking to us is how the democrats could elect her to Congress? Ilha Omar is one of two Muslim females to serve in Congress. At this rate she may also be the last. This entry was posted in politics, Protest and Agitation and tagged congresswoman, Ilha Mor, rebuked by Pelsosi. Bookmark the permalink. The “double standard” is that when people on the left say racist things we don’t unify behind them; we make them apologize immediately. Meanwhile Steve King has been a white nationalist for years without any major Republicans speaking out, and the president just tweeted that Latin Americans are going to ruin our country. Pull the log out of your eye. Was gonna reply to Chris, then I remembered he just can’t help him/herself. Good for Pelosi. 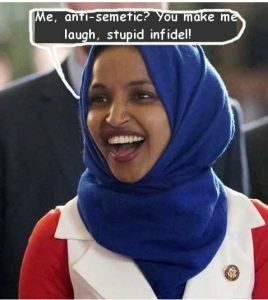 This is not Omar’s first anti-Semitic comment and I doubt it will be her last. As you allude to, her comments are harmful to Jews and Muslims alike, both of whom deserve better representation than this. Now if only Republicans would be as outspoken about the president’s bigoted comments about Latin Americans as Democrats have been about a freshman congresswoman’s anti-Semitism. An influx of 42 Million of any race would be a disaster! It is the quantity he is talking about. It is the quantity that is the subject of the sentence. If you remove the quantity from the statement it is not a disaster. If you remove the source, “Latin America” from the statement it is still a disaster but it doesn’t state where the illegal immigrants would be coming from. Clearly the focus of the statement is the quantity and the fact that he stated “Latin Americas” is to clarify the source and the border they are crossing. If he said “42 Million Canadians” it would still be a disaster but it would not be true. We are not at risk of having 42 Million Canadians coming across the border if there are open borders. But, we are at risk of having 42 Million people crossing the border from Latin America. Why? Because Latin America is a mess run by corrupt governments. That’s the problem we need to address but that is not the subject of this discussion. I have to say one more thing. The left (including Chris) loves to use the terms “racism” and “racist” to describe policies and people they don’t agree with. This is either a disingenuous tactic to smear political opponents and to try to recruit other people to hate the policies and people involved OR, they really believe the polices are racism and the people are racist. If it is the first it is an example of how Machiavellian, and despicable, and dishonest the left can be. If it is the latter it demonstrates the racism of the LEFT! How could a WHITE man be concerned about the negative effects of dealing with 42 million illegal immigrants. Since he is WHITE the reason for the concern MUST be based in racism. Chris, you twisted Trump’s words to make a non-racist statement a racist statement. Do you have difficulty parsing an English sentence? I doubt it. I believe you know exactly what you are doing. You are taking the fact that he indicated the direction the illegal immigration would come from to spin the statement to make it look like Trump is a racist. You are following a established tactic of the left. If you CAN twist an opponent’s statement so it looks like racism, and that can be used against the person who made the statement because of THEIR race, then go ahead and denounce their statement as racism. That’s what you did Chris, and that isn’t even implied racism, it is blatant racism! So…. Chris, you are a racist! How does that make you feel? I’m waiting for the Left to declare Cesar Chavez a racist, since he fought to stop illegals/”Wetbacks” ( his word, not mine) from crossing our border with Mexico. I’ll bet Chris has never watched this video of Chavez talking about the “Illegals/Wetbacks,” I’ve posted many times before. And the Dems have done their best to rewrite our history so voters will never know the truth, so they’ll have a future pool to keep them in power. Peggy, I’ve said it before, and I’ll say it again. “Wetbacks” is a racial slur no matter who says it. You know this, which is why you do not use the term yourself in these pages. My point Chris is Chavez was also against illegals crossing our border to take jobs from American farmworkers. Did that make him a racist? You also used to say using the word “illigal/s” wasn’t allowed because it was a racist and politically incorrect word. It appears to being used more these days to distinguish between those here legally and those who broke our laws and crossed our border illegally. Whether it’s Chavez and others during his time calling a group of people Wetbacks or people of today calling the same group of people Illegals my question still stands. Are Cesar Chavez and the thousands of farmworkers racist for not wanting a group of people coming to America and doing everything they could to stop them? If not, why? Does it have to do with the color of their skin, or that one man has orange hair? Also, it’s obvious you still haven’t watched the video of Cesar Chavez speaking about his efforts to protect the lives and livelihoods of his farmworkers. If you had you’d never have made your ridiculous statement about his use of the term Wetbacks. You wouldn’t be able to deny what you saw and the truth laid out before you. Noticed also, as a teacher you said nothing about the rewriting of our history. I’d think you’d want your students to know the truth and not fill their minds with more lies. Look it up and pass it along before it’s completely erased and gone forever. Chris, I’m beginning to believe that you have a problem understanding English. Peggy is not arguing that “Wetbacks” is not a racial slur. She is pointing out how selective the Left is in their pseudo righteous indignation. It is perfectly reasonable in the Left world to twist a non-racist comment and declare it racist so they can attack someone for political gain and then give a pass to members of the Left that say racist things or commit racist acts. This is so true in Virginia. And, who do you think you are “schooling” Peggy about what words can or can’t be used? This is another dishonest tactic of the Left. The Left likes to control speach. They want to label certain words as being sooooo bad that no one can use them, not even people discussing how bad they are. This just makes the words more powerful and divisive and gives them another tool for labeling their opponents as racist. I’m not a big fan of Megyn Kelly but there was a huge backlash because she just wanted to talk about blackface. She wasn’t in blackface, she didn’t declare blackface good. She just wanted to talk. I doubt that was the only reason that her show was cancelled but I’m sure it gave the network the opportunity to satisfy the Leftists that were demanding her firing. Did these leftists demand Jimmy Kimmel be fired because of his very insulting impression of Karl Malone? How about Jimmy Fallon and Bret Baier who both also appeared or were photographed in blackface. Should we drum Eddie Murphy out of the business and label him a racist for appearing in whiteface? Why can’t we talk about these words. They are just words. There is no way to diffuse their power without talking about them. By making it taboo to even discuss them we are giving justification to every person to react violently when they here the words used. Now Chris, I suggest you read this over several times before you respond to make sure your response is relevant. Chavez died in 1993. I don’t see what his use of racial slurs tells us about what is and is not acceptable today. Here’s an interesting article from a Mexican-American liberal wrestling with Chavez’s contradictions. Are Cesar Chavez and the thousands of farmworkers racist for not wanting a group of people coming to America and doing everything they could to stop them? I mean, that’s the definition of xenophobia. This is not a rational fear at this point in time. Immigration is way down. Doing “everything to stop them” is a hysterical overreaction right now. It is not a position deserving of the benefit of the doubt. There is no context that magically makes a racial slur designed to denigrate another group not a racial slur, Peggy. You didn’t give me anything specific enough to respond to. What exactly is it you are accusing teachers of lying about, and what is your evidence of this? I understand you’re a fan of Dinesh D’Souza, a felon who lies about history frequently, as documented by actual historian Kevin M. Kruse. So why should I trust that your interpretation of history is correct and the teachers are wrong? I’m not a big fan of Megyn Kelly but there was a huge backlash because she just wanted to talk about blackface. She wasn’t in blackface, she didn’t declare blackface good. She just wanted to talk. I agree that Megyn Kelly’s comments weren’t worth drumming her out of show business for. I do think she would have been given more of a benefit of the doubt if she hadn’t had a history of worse comments, her insistence that “Santa is white” being the most embarrassing of those. Should we drum Eddie Murphy out of the business and label him a racist for appearing in whiteface? I can’t speak to the other examples you brought up, but this one is ridiculous. There is no history of white actors being discriminated against in our culture’s media while being demeaned and ridiculed as a group through whiteface, so comparing it to blackface is just ignorant of history. I don’t know where this taboo about “discussing words” exists. I see racial slurs discussed all the time on the left. What you seem to object to is people drawing conclusions about those words that you disagree with. For example, my use of the word “racist” to describe Trump’s constant, never-ending irrational fearmongering about Latino immigrants. He claims we are overrun by these immigrants even as their numbers continue to fall, a trend that began under the Obama administration. Since his position is not based on any objective facts, one has to at least consider that it is motivated by bias. No, we are not, and the Gallup poll did not find that we were. The poll asked Latin Americans “Would you move to the United States if you could?” That question has little to do with open borders, unless you think Latin Americans have no other circumstances in their lives that would prevent them from packing up and moving to another country other than that country’s laws. But thinking that would reveal a lack of thinking about Latin Americans as people, and thinking of them only as part of a potential invading horde, as the president does. In Trump’s mild defense, the Gallup CEO completely misrepresented his own company’s poll in his editorial about the subject, jumping to the same false conclusion as Trump and yourself. But Trump has spent every day since his initial campaign announcement fearmongering about Latin Americans coming to the US, falsely attribution a connection to crime and unemployment to Latin American immigrants. He’s declaring an “emergency” over the issue even though immigration is way down and border arrests are up. This makes no sense, and if you think it earns him the benefit of the doubt that he did not mean anything about the quality of Latin Americans as people in that tweet, you have to ignore every bit of context regarding his treatment towards that people since 2015. I refuse to do that. The benefit of the doubt is gone. The tweet was part of a long pattern of spreading false accusations toward a minority group. Anyone who refuses to see that is ignoring reality. I also notice you keep referring to the 42 million Latin Americans who would move here (which don’t exist) if we had open borders (which have no chance of existing any time soon) as “illegal immigrants.” Do you not know what “open borders” means? If we had open borders and they all chose to come here, by definition they would not be “illegal immigrants,” they would be legal immigrants. That you don’t realize this seems to indicate that you’re using the term “illegal immigrants” not because you’re concerned about the law, but because of racial bias you may not even be aware of. Chris, I had a good laugh when I read your response to my post because it is pathetic! Another dishonest tactic of the left is “misdirection”. My response to your post was to call you out for being racist because you twisted the meaning of the Trump comment to make it racist when it wasn’t racist at all. Go back and read my comment. I wasn’t arguing the number of immigrants. It could be 1 million, 50 million, 100 million, I don’t care. That has nothing to do with my comment. If you had argued in your original post about the number of immigrants and had not labeled the comment racist I would have never responded. I don’t think anyone can accurately estimate the number illegal immigrants (even with a poll) because circumstances are constantly changing so the margin for error is huge. I called you out for twisting a comment that wasn’t racist into one that was and I stated that doing so was a dishonest and a racist act in itself. It is also extremely dangerous because it just adds more fuel to all the hate that is driving those in the country that don’t make an attempt to think for themselves. So I will state it again; twisting the meaning of a statement that isn’t racist to make it racist so you can use it against a person because of their race is a racist act. Anyone that would do such a thing has to be considered racist. If you want to respond stick to the issue! I read and understood your comment just fine. I rebutted it very clearly. How could you think I didn’t understand it when I rebutted your claims exactly as you describe them here? I wasn’t arguing the number of immigrants. But Trump did, and his inflation of the number is a racist tactic, as I explained. It is irrational, dishonest fearmongering about a specific ethnic group to portray them as a threat to our way of life. Under no rational definition is that not racism. There are not 42 million Latin Americans who would come here if we had open borders. And we are not going to have open borders. The tweet was based on two racist lies. If you had argued in your original post about the number of immigrants and had not labeled the comment racist I would have never responded. I’m sorry the word racist triggers you. It applies, for reasons I have clearly explained and which you failed to rebut. You did so even while projecting your own misdirection tactic onto me. I don’t know if that was brilliance or stupidity, but it certainly wasn’t common sense, especially since you should know by now that I would call you out for it. I don’t think anyone can accurately estimate the number illegal immigrants (even with a poll) because circumstances are constantly changing so the margin for error is huge. K, now it’s clear you didn’t read my post while accusing me of not reading yours. No one tried to estimate the number of “illegal immigrants.” Even Trump’s misinterpretation of the data (a misinterpretation tragically shared by Gallup’s CEO, who should step down) doesn’t claim to be about illegal immigrants. The Trump tweet claims it’s about the number of Latin Americans who would come here if we had a legal open borders policy. In reality, the poll asked Latin Americans if they would move to America “if they could,” which is a broad question that could be interpreted to mean any number of factors besides America’s border policies. Neither the president’s misinterpretation nor the accurate interpretation of the poll have anything to do with illegal immigrants. So why do you keep saying “illegal immigrants” when what you mean is “potential LEGAL Latin American immigrants?” If not ethnic bias, what would cause you to make that mistake, even after being corrected on it? But me calling that out does? Do you see how that makes zero sense? Are you insane? Now you are accusing me of criticizing Trump because he is white, not because of the actual words he said? You should change your username so you can avoid at least some of the embarrassment you’ve brought on yourself. Bottom line Chris, Trump’s comment was not racist, yours was. So no rebuttal at all. No acknowledgment that the terminology you used above was wrong. Just a repetition of a claim that I have already exposed as nonsensical, in ways that you will not and cannot defend. Pelosi should remove her from any committee/s she’s on too. If she doesn’t, Steve King should be reinstated to his. Where has Pelosi said anything even remotely as offensive as Steve King’s racist comments about non-whites? Read what I said again, Chris. I clearly stated AOC should be removed from committee/s by Pelosi, since King was removed from making similar types of remarks. Equal punishment should be applied to all members of Congress. Oops, “from” should be for. I totally agree Peggy. Fair is fair. Sorry, Peggy, for the misreading—my bad. I also assume you meant Ilhan Omar and not AOC. I don’t think the situations are equal in either intensity or sheer volume. King has a long record of racism, for which he makes no apologies. Omar did make what to me sounded like a genuine apology for her use of anti-Semitic tropes (tropes which the president has also trafficked in; see below). I think she deserves a chance to prove whether that apology is genuine or not. If she doesn’t learn from this experience and engages in the same kind of behavior again, then I think we can say her actions are on par with King’s. Oops, my mistake too. I did mean Ilhan Omar not AOC. Agree, we’ll see what her track record is and not condemn her based on one remark. But, it’s not looking good for her. List of Dems against her remarks is growing. Glad we can agree and I’m heartened that Democrats are holding their own accountable. We saw this also when the DNC removes their sponsorship of the women’s march due to anti-Semitic comments from some of their leadership. I did not attend the match this year even though I agree with most of their causes for this reason. We should all aspire to hold our own accountable and move beyond partisanship. Chris, our world would be better off if both parties told the truth and were held accountable for their mistakes and wrong doings. Glad you rejected a group that was being led by people filled with hate for others. Wish you and others had so when The Women’s March rejected women of faith and prolife from participating. Wish also the media had covered the March for Life that takes place every year the day before the Women’s March, but they don’t. Republicans have learned we aren’t treated equally no matter our issues or our causes. The media will support Left issues as long as it’s profitable. If supporting the Right pays more, they’ll throw you all under the bus and you’ll understand how it feels to not have a voice and be rejected. Humm, wonder if that’s why the Walk Away movement has gotten so big? I can see why pro-life people would feel rejected by a movement that explicitly advocates for abortion rights, but I’m not sure what you would want the Women’s March to do about that, short of changing their position on that issue. I don’t hear pro-choice people complaining that they’ve been “rejected” from the March for Life; we know it’s not for us. Were there a lot of Muslims at the March for Life? Would they be welcomed? Wish also the media had covered the March for Life that takes place every year the day before the Women’s March, but they don’t. Republicans have learned we aren’t treated equally no matter our issues or our causes. The media will support Left issues as long as it’s profitable. If supporting the Right pays more, they’ll throw you all under the bus and you’ll understand how it feels to not have a voice and be rejected. Humm, wonder if that’s why the Walk Away movement has gotten so big? I see no evidence that it has. Chris, pro-life women were prevented from participating in the march. As were Jewish women. Maybe they should change the name to Some Women’s March to be accurate, because it’s not open to all women’s groups who want to participate. “ON THE DAY AFTER THE inauguration of President-elect Donald Trump, thousands of women will descend upon Washington, D.C. to march in solidarity with one another, sending a message to the new administration. However, this march in support of feminism is not open to all women. I was referring to the Jewish faith, which appears to be the reason so many groups across the country pulled out of participating with the original group’s march. Jewish faith women apparently chose to support local groups, not the DC original group. No Chris, the media coverage was not balanced. “The crowds attending the Women’s March on Washington and the March for Life are comparable — but the amount of time the media devote to them is not. The major television networks gave the Women’s March on Washington 129 times more coverage than last year’s March for Life, according to a study by the Media Research Center published on Wednesday. ABC, CBS and NBC combined to spend one hour, 15 minutes and 18 seconds talking about last Saturday’s Women’s March — an explicitly pro-choice event sponsored by Planned Parenthood and NARAL Pro-Choice America, among other abortion advocates. But last year, ABC was the only network that even mentioned the March for Life, devoting a total of 35 seconds to the largest pro-life rally in the world. Of that coverage, 22 seconds came in a story about a group of high school students who attended the march but got stuck in a blizzard on their way home. The Women’s March drew an estimated crowd of 500,000 to Washington, D.C., to protest the inauguration of President Trump. Millions more attended women’s rights rallies all across the world, including in Chicago, London and New York City. The March for Life will hold its 44th rally on Friday and regularly draws hundreds of thousands of pro-life protesters. The 2013 march drew an estimated 650,000 to the nation’s capital alone, according to media reports at the time. Chris, pro-life women were prevented from participating in the march. As were Jewish women. I am going to need a better source for your claims on media coverage of the two events than the Media Research Center, an extremely anti-gay far-right group that routinely pushes lies and false statistics. I wouldn’t be surprised if the Women’s March was covered more heavily than the March for Life–it’s a much newer event, for one thing–but I see no reason to trust MRC’s numbers. Information about Omar’s representative district and surrounding area provides insight into actions and statements. A little long, but worth reading. “More men and boys from a Somali American community in Minneapolis have joined – or attempted to join – a foreign terrorist organization over the last 12 years than any other jurisdiction in the country.